Fan-shaped panel in soft metal of two main colours, shibuichi and shakudō, engraved in katakiri with a waterfall. 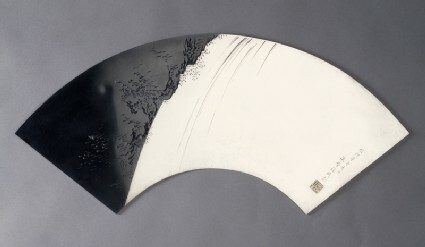 Engraved signature: Unno Shōmin koku. Seal: Hoshu sei. Dated: Meiji kanato-unatsu no hi (summer 1891). Half a generation younger than Kanō Natsuo, and his natural successor Unno Shōmin (1844-1915) is usually considered the finest Meiji metalworker after Natsuo [see EAX.3852]. He won prizes in many International and National Expositions, and one of his figure studies in the Third National Exposition was purchased by the Imperial Household Agency. 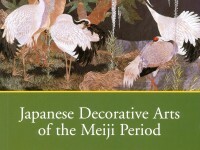 He was a professor at the Tōkyō Art School from 1890 and became an Imperial Artist in 1896. The deep cutting of the engraved panel is a triumph of skill in a difficult process; with a broad chisel this nevertheless achieves a surety of line that is quite remarkable. The juxtaposition of the dark shakudō riverbank with the silver waterfall is typical of Shōmin’s inventiveness. This is also remarkable for being dated. It would originally have been mounted on a framed panel of kiri wood (Paulownia), probably without glass. Purchased with the assistance of the Story Fund, 1998.